In the last 30 years there have been significant advancements around new theories of effective organizational leadership. Despite these developments, the old paradigms of leadership and management still pervade in many small businesses today. As a result, there’s a growing discrepancy between the development of leadership theory and the actual practices in many organizations. That is because effectively shifting to the new paradigm requires that leaders consciously change their habits and practices. Learning the terminology or just reciting definitions and concepts doesn’t mean that you’re walking the talk! The old paradigm of organizational leadership is centered around the leader as the locus of control. You know that model – the leader is “the guy in charge.” It is common practice that all decisions must go through the leader first. The leader hoards information believing that it is what gives them power and a means of maintaining control. They’re often stuck in the role of problem solver. All of this stems from a belief that no one cares as much about their company as they do, that employee’s won’t take any personal responsibility for their work and they need to be controlled. In addition, this leader fears getting hosed by the competition should any “sensitive” information be shared with them. 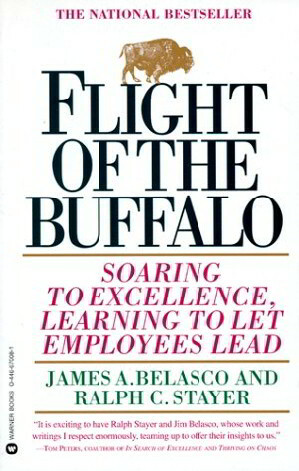 As Belasco and Stayer observed in their book, the relationship between the leader and their team in the old paradigm resembles a heard of buffalos. “Buffalo follow one leader absolutely.” So, when a heard of buffalo loses their leader, they’re helpless and easy to kill off. A few hundred years ago, the settlers nearly wiped out bison by killing the head buffalo. Without their leader the rest of the herd just stood around, waiting, making easy prey. That’s what employees in an organization led with the old paradigm are like. They wait around for direction, incapable of making decisions because they aren’t allowed to. Ultimately, they create a liability for your organization, becoming easy prey rather then contributing wp-content/uploads. The new leadership paradigm is centered around the belief that, given the opportunity, your employees will take personal responsibility. Beyond that, they possess critical knowledge and abilities, known as intellectual capitalism. If led properly, they’re actually an asset that you can be better leverage to help your organization succeed. Therefore, the new paradigm is less about the leader as the center of control and more about her empowering others to lead. Belasco & Stayer call this new paradigm Leading the Journey. These two serial entrepreneurs share the story of their own experiences of overcoming the limiting practices from the old paradigm to embrace Leading the Journey in their book, Flight of the Buffalo: Soaring to Excellence Learning to Let Employees Lead. The first big challenge they faced was letting go of the comfort and perceived safety of their old practices. But with time and diligence, they came to understand that in order for their businesses to change they needed to change first, and so they began engaging in a process of continually learning, growing and improving. Luckily, they also provide a framework to help you to develop the skills, attitude and practices for Leading the Journey. As a leader masters the practices of Leading the Journey in their business, they see fantastic results in productivity, profit and overall impact. Team members have more ownership of their work. The leader, having adopted a strategic mindset rather then a tactile one, provides overall direction while empowering employees to take responsibility for execution. And the business becomes more nimble, ready and able to improve so that you may dominate our changing marketplace. In the Leading the Journey paradigm the team resembles a pack of geese, flying as a unit towards the same destination with everyone taking turns leading the pack. Are you effectively leading your team (and yourself) towards the change and improvements you seek? We will help you get on track at the August 16th EntrepreNerds Professional Development Workshop where we’ll be discussing Flight of the Buffalo: Soaring to Excellence Learning to Let Employees Lead. For more information or to sign up visit us online www.Meetup.com/EntrepreNerds. Ariana Friedlander is the Founder and Principal for Rosabella Consulting, LLC and has over nine years of experience working with small businesses, nonprofits and government agencies to create strategies for successful organizational growth. 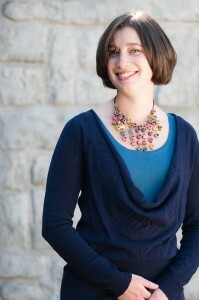 A dedicated life-long learner, she is also the Lead Facilitator for EntrepreNerds. EntrepreNerds is a business book club for professionals and entrepreneurs who are committed to expanding their knowledge and skills through self-paced learning. Every month, EntrepreNerds participants read the assigned business book then come together for a guided discussion, facilitated to encourage experiential learning, so that participants may explore ways to actively incorporate what they read about into their daily routines and business practices.